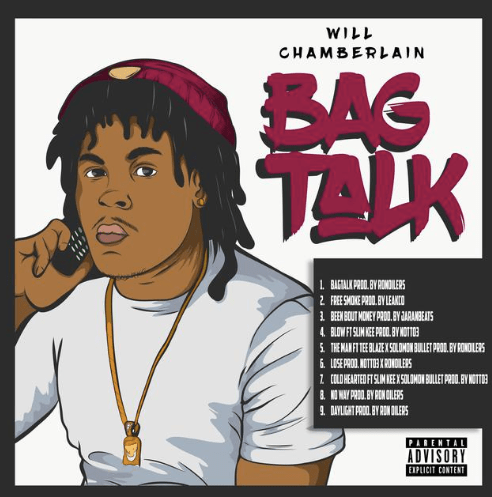 Richmond, Virginia native Will Chamberlain put his everything into the making of his debut album, Bag Talk, and it shows. On the project, the rapper/songwriter delivers a trap soundtrack where he rhymes about getting to the paper by any means. Additionally, Will displays his versatile songwriting capabilities in songs like “Cold Hearted” and “Lose” which are more laid-back and heartfelt. The features and production on Bag Talk include Solomon Bullet, Tee Blaze, Slime Kee, Ron Oilers, Notto3, and JaranBeats. Stream Bag Talk on Spotify below and find it on iTunes here.